You are here: Home / Blog / Blog Posts / Are you in a travel rut? Are you in a travel rut? Have you ever gotten stuck in a travel routine just because it’s the way you’ve always done something? It’s easy to do! So, one of the exciting things about working at SHD is providing “lightbulb moments” for travelers and getting them out of their travel rut! With our new flights to two major hubs, Washington Dulles and Chicago O’Hare, we’re changing the way you connect with the world! 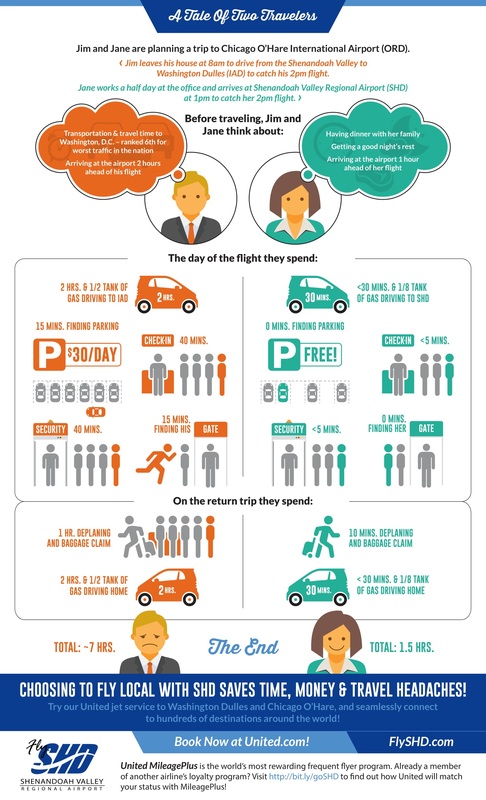 Take a look at the difference flying from SHD can make in your travel experience. SHD brings you the reliability of United powered by SkyWest for your local connection to the world. With fares starting at just $80 roundtrip to Washington Dulles and $210 roundtrip to Chicago O’Hare, plus competitive pricing to hundreds of global destinations, why not give SHD a try? Click here to book now! https://flyshd.com/wp-content/uploads/2018/07/EDITED_airport-802008_1280.jpg 200 500 Shenandoah Valley Regional Airport /wp-content/themes/shd-enfold-child/images/logo.png Shenandoah Valley Regional Airport2018-07-16 16:56:482018-07-18 11:27:44Are you in a travel rut? Women Can Fly 2018 Don’t Miss Out on These SHD Travel Perks!